The Honda Technical Research Institute was established 24th September 1948 in Hamamatsu, Japan. The following year it was re-incorporated as the Honda Motor Co. we know today, at the same time launching the first proper Honda motorcycle, the 1949 D-Type (Dream) 2-stroke 98cc. The company has gone from humble post-war beginnings to consistently being the largest manufacturer of motorcycles since the ‘60s after opening their first US dealership in 1959. In the UK Honda makes up 20% of all registered motorcycles (over 270,000 bikes), 50% more than it’s closest rival Yamaha (178,000). Here is a useful list of all Honda motorcycles. The companies’ founder, life-long petrol head, engineer and entrepreneur Soichiro Honda, was hooked by the smell of motor oil as a child. After a stint as a car mechanic following a garage apprenticeship, he set up a car tuning business, before moving into manufacturing; mass-producing piston rings for Toyota cars. After WW2, with the production line shattered by bombs and an earthquake, Soichiro sold the remains of the manufacturing business to Toyota and in 1948 built the first Honda moto-bicycle, the A-Type with a job lot of surplus 50cc two-stroke engines bolted to bicycle frames. After starting the Honda Motor Co. in 1949, Soichiro Honda remained president until he retired in 1973, but stayed with the company as a Director and advisor until his death in 1991 aged 84. Honda is well renowned for reliability as well as innovative engineering and has produced some iconic bikes; from workhorses serving millions everyday, through to engineering showcases that push the boundaries of technology and design. The Honda Super Cub is a 4-stroke single cylinder ‘step-thru’ scooter / motorcycle ranging from 49-109cc across a variety of sub-models. The Super Cub is the most produced motor vehicle in history with over 87 million built since production began in 1958. Providing low-cost motoring for the masses, the Super Cub is much loved for its reliability, build quality, practicality and frugalness. Check out this awesome Repsol Honda Cub C90 custom bike. Over the years Honda has pushed the boundaries with its motorcycles - building what can only be described as feats of engineering. In the late 70's Honda built the CBX, a motorcycle with 6 cylinders, advanced double overhead cams and 24 valves. In the late 80's Honda built the VFR750R also know as the RC30. The Honda RC30 was a revolution; a V4 4-stroke engine provided linear power with amazing traction. The RC30 was built to win, taking consecutive WSB titles in 1988 and 1989 and was the first motorcycle to achieve the 120 mph lap at the Isle of Man TT ridden by Steve Hislop. In 1990 more than half of the F1 class at the TT rode Honda RC30's. The RC30 emits an incredible V4 burble complimented with a soft whine of the gear driven cams, one of the most epic noises produced by a motorcycle. In 1994 the RC30 was replaced by the Honda RC45; another truly special Honda motorcycle (many say a better road bike than the RC30). Like the RC30, the RC45 is an incredibly sought after motorcycle today, however arguably less iconic than its older brother. In the early 2000's the RC51 (aka the Honda SP1 and SP2), a 1000cc V-Twin Superbike, was specifically built by Honda to take on Ducati who dominated WSB. The RC45 could no longer cut it, the rules in the Superbike class allowed 2 cylinder motorcycles to have a capacity of up to 1000cc whereas 4 cylinder motorcycles were limited to no more than 750cc - putting the RC45 at quite a disadvantage. The RC51 took Honda to victory in the 2002 taking the manufacturer title from Ducati. It was one of the most incredible title races in the history of WSB - a fierce race not just between Honda and Ducati but that also of their riders Colin Edwards and Troy Bayliss. Honda really showcased what the company could do by producing the NR750 in the early 90's. The NR was the only road going bike to have oval Pistons, with 8 valves per cylinder (32 in total) ignited by 2 spark plugs per cylinder. The oval Piston set up effectively gave it the characteristic of a v8 rather than a v4. It was a hugely expensive bike to produce and buy at £38,000 (over £72,000 in today's money), very much an engineering showpiece - the Bugatti Veyron of bikes. More recently in 2015 Honda produced the RC213V-S, a road going version of the incredible RCV MotoGP bike ridden by Marc Marquez and Dani Pedrosa. How could anyone forget the Honda Fireblade (often referred to as a ‘Blade’). 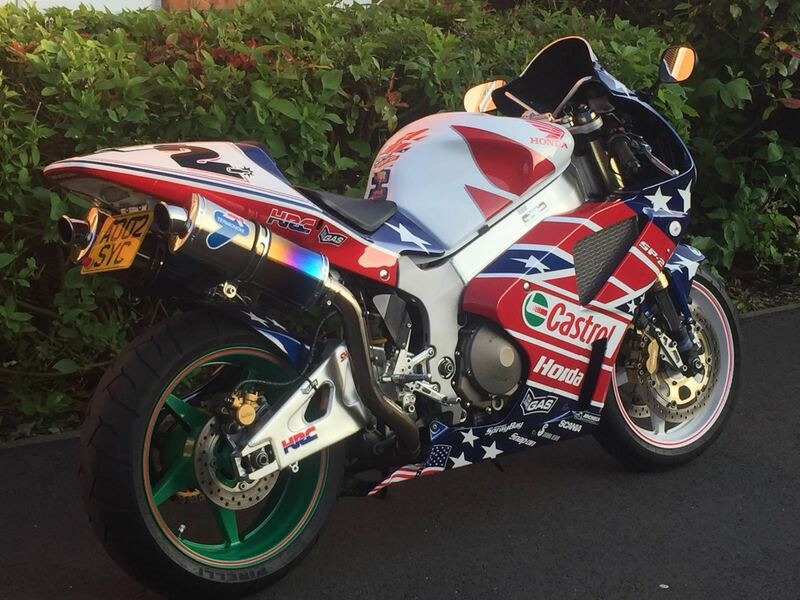 The Fireblade, when launched in ‘92 was a game changer that has turned into one of the most iconic names in motorcycling. Mention 'Fireblade' to a non biker and they will know what it is. See the latest 2017 Honda Fireblade launch review here. In 1982 HRC was set up as a separate company, winning the Suzuka Eight Hours race on a CB900F. Since then a range of iconic motorcycles have continued to establish Honda’s racing pedigree and formed the basis of some groundbreaking road bikes. After winning the 2006 MotoGP title with Nicky Haydon on the 900cc RC211V, new MotoGP rules reduced engine capacity to 800cc and Honda rekindled its love affair with the four-stroke V4, culminating in Casey Stoner running away with the 2011 GP title on a RC212V, just in time for the rules to change again. Read our article about Honda’s love affair with the V4. Honda has had a long and very successful association with road racing, particularly the Snaefell Mountain Course of the Isle of Man TT. They partnered with all time leading TT winner Joey Dunlop (26 wins) from 1983 until his untimely death in 2000 and of course John McGuiness (‘King of the Mountain’) with 23 wins. Honda also runs an endurance racing team known as the Honda TT Legends. How can BeMoto Bike Insurance protect your Honda? Not only do we offer tailored insurance cover for standard and modified road legal motorbikes, we also have a number of non-road products, whether you have an old CB750 gathering dust in the garage, a CRF250 motocross bike or a race-spec CBR1000RR "Fireblade" for the track – even your kids QR50 or quad bike.